The Book of Job in the Old Testament is about a faithful man who suffered afflictions, not blessings. The Holocaust is another example of a people faithful to scripture not being protected by their God. Similarly, poverty in the West serves as evidence that a free market economic system does not automatically lead to the happiness of all who live under it. And, the collapse of communism in the USSR is evidence that government allocation of economic resources leads to economic collapse and misery. It is time to move beyond the naïve rhetoric of our inherited economic dogmas and attempt to understand why they rely on a lot of magic and how the scientific study of human economic nature can lead to better solutions. In the debates between left and right, free marketers on the right often cite Adam Smith and his “invisible hand” of the market, while socialists on the left consider the invisible hand to be an article of faith. The socialists are right. The term “invisible hand” is a non-scientific name given by Smith to explain a phenomenon he observed. Like the idea “the tree god makes the wind blow,” this type of supposition is a label attached to an observed phenomenon to describe human experience and observation without scientific explanation. By pursuing their own happiness, sellers are motivated to produce and buyers are motivated to buy, if they have the money or goods to trade. To get money to trade, buyers also have to produce something they can sell or trade to others. Every human being is producing and selling things that other people want, and earning enough in return to provide for his basic needs and to be a good consumer. There is pure competition in the market, e.g., there is a virtually unlimited number of sellers and buyers, and everyone has equal opportunity to produce, sell, and buy. There is no government regulation that provides an economic advantage to any player. There is a virtually unlimited supply of natural resources, or what resources exist are equally available at the same price to all producers or sellers. In real life none of these conditions apply. Not every person is able to compete competitively, or even wants to. Many people are raised in economic subcultures or without adequate education and skills to function in a purely competitive market. Such people either end up working at a low wage job for others, receive some form of welfare, or starve. There is almost never pure competition in a market, but either a market in which a few sellers dominate with asymmetric economic advantage, or government protections through devices like patents that allow some players a competitive advantage or make it illegal for most people to enter a particular market. And, the earth’s resources are not unlimited and many resources are controlled by large economic players or governments, who allocate to their favorites. Because the invisible hand is a theory for economic growth, encouraging the production of goods and services, the West has prospered tremendously in the past 200 years by adopting a belief in it. 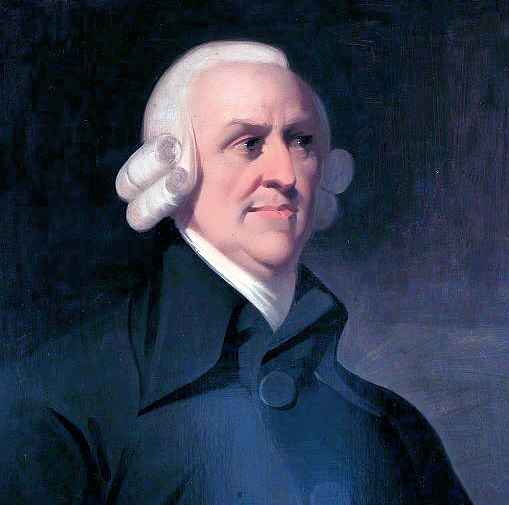 The economic conditions that existed at the time of Adam Smith in the U.S. were such that each family was able to run a farm, a shop, or a service that could be sold to others. There was also the necessary protection of private property that enabled a market to function. Except for the handicapped or the willfully indigent, the economic system was of such a type that the “invisible hand” appeared to work. Portrait of the political economist and philosopher Adam Smith (1723-1790) by an unknown artist (known as the ‘Muir portrait’ after the family who once owned it). However, the development of large consolidated corporations, funded with capital investment from Wall Street or elsewhere, has radically changed the dynamics of the economy in a way that the “invisible hand,” to the extent it exists, only applies to a few players, and not the majority of citizens. For example, there may be competition between BP, Shell Oil, and Exxon-Mobil in the oil market, but hardly anyone else is really able to play that game. Today almost every traditional family business, from farms and restaurants to industrial production, has become consolidated with owners being investment bankers or stockholders. The profits are divided among these people and not among the masses of middle-class buyers and sellers who engage in the trades. The current system creates a growing disparity between rich and poor and shrinks the size of the middle class. In our present economic system, the conditions required for the invisible hand to work no longer exist. Despite what many on the left may say, the current economic system does not invalidate the principles that Smith spoke about, it only reflects the fact that the conditions required for economic growth for all are no longer operative in our social system. The scientific study of government reveals that governments have the power to redistribute wealth by force, and can modify inequity to some degree. However, governments not only need producers to create the wealth that they will divide, but they also cost money to operate and take a chunk out of the pie that would otherwise be divided between producers and dependents. Thus government redistribution is not only a win-lose situation, unlike the win-win of the competitive market, but the expense of government comes at the cost of reduced overall economic growth. …there is a reverse invisible hand: People who intend to serve only the public interest are led by an invisible hand to serve private interests, which was no plan of their intention. The “reverse invisible hand” is a label used to describe observed behavior in present Western governments. The economic laws that govern the nature of human beings serving in modern government, and the actual dynamics of government agencies regarding the use and distribution of money have been increasingly studied and described by economists like Friedman and sociologists like Max Weber. And, as the invisible hand required certain social and economic conditions to apply, there are ideal conditions for the “reverse invisible hand” not to work. Government work should be voluntary service, and workers produce their personal economic support outside their government job. Social services of churches tend to function along these lines. Government decisions would need to be free of conflicts of interest, and reflect the will of a large majority of the people. The will of political parties and government agencies whose members would benefit financially from the government program are the primary shapers of policy today and have near-total conflicts of interest. Government agencies would need to be structured to reduce the number of beneficiaries of welfare by successfully enabling them to become capable producers in a competitive marketplace. But today agencies are paid based upon the number of people they serve, so it is in their interest to keep people dependent and increase the number of people in their care. Understanding the necessary economic principles for growth for all in a properly regulated market, and normal economic principles at work in governments will lead to policies far different from those currently advocated by the Republican or Democratic parties. Generally the criticisms of each party by the other are accurate, but the solutions advocated by both are self-serving and against the interest of the “ideal of creation,” where every human being is a perfected individual truth body contributing their unique talents to the well-being of themselves, and to society as a whole. The laws that foster the lack of economic equality can be fixed, but there is no reason to expect the policymakers we appeal to will want them repealed. It is not in their interest. Rather, like the system the U.S. founders created, legislation must be designed for systemic functionality, not based on political pressure from economic interest groups. Things like eliminating political party affiliation on ballots, and restriction of campaign contributions to individual citizens with $100 per candidate per campaign, would have huge positive consequences. Voters would have to become aware of candidates’ skills and would be unable to vote a “party line.” Candidates would be restricted in the funds they could use for advertising, and journalists would be forced to return to investigative reporting on candidate skills rather than commentary on political ads. The power that the money that influences politics represents would be widely distributed across a large swath of citizens, with labor unions, corporations, and other interest groups reducing their importance to politicians. 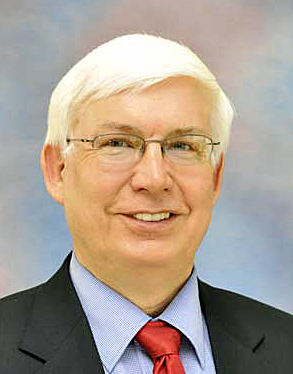 Dr. Gordon L. Anderson (UTS Class of 1978) is the President of Paragon House, Editor-in-Chief of the International Journal on World Peace, and Adjunct Professor at the California Institute of Integral Studies. He earned an M.Div. in Christian Ethics at Union Theological Seminary and a Ph.D. in Philosophy of Religion from Claremont Graduate University. ← Will We Ever Walk Justly? Thank you, Gordon. This is really clear. What do you think of a Citizens’ Basic Income as a step towards solving some of our more pressing inequities of distribution? Alison, I think social safety nets are important. It really depends on how they are conceived to do the job (1) without creating dependence, and (2) without killing the overall economy. As mentioned in the article, the most productive system is one in which all people of working age and ability are fully employed and self-supporting, and only a small minority need help from others — children, elderly, and disabled. The best way to accomplish this is have a system that naturally distributes money and power (ownership) widely, fueled by win-win market transactions that lead to economic growth. I think most Citizen’s Basic Income plans have been conceived of as funded by some form of government redistribution — like what the Soviets, and more recently Greece, have tried. As I mentioned in the article, redistribution often requires centralization of power and money, and this causes economic decline because such systems are fueled by win-lose transactions plus bureaucratic overhead. A redistribution system, while win-lose, is more sustainable with modern computer algorithms because they can replace the bureaucratic overhead associated with government employees that burden the economic system with non-productive payrolls and pensions. These employees, however, must find a greater incentive to work in productive win-win jobs in the market sector than in government, and this requires the break-up of large monopolistic corporations and ownership of capital by large funds managed by a few people — the 1 percent. I really imagine a system in which everyone becomes a true owner, not a perpetual serf dependent either on the government or a large corporation for a rationed life, planned by either a Wall Street-placed CEO or a government bureaucracy. Thank you Dr. Anderson for a very intelligently written article. You conclude by saying, “The laws that prevent political viruses must be recognized as more important than the use of a political party by a citizen, or a bureaucratic office by a government administrator to gain something for himself at the expense of the whole.” The law that prevents selfish gains at the expense of the whole has been suggested — the law of subsidiarity. It is an organizing principle that social matters ought to be handled by the smallest, lowest or least centralized competent authority. Political decisions should be taken at a local level if possible, rather than by a central authority. So, the question how can a truly intelligent society reach consensus on the smallest or least centralized competent authority? This fundamental self-governing and self-correcting unit would be the software programmers (middle class) entrusted with the responsibility of keeping the computers running free of infection. As it seems, the malware is coming from all sectors of the system: unions, owners, attorneys, academicians, militarists and other power brokers. We are seemingly no closer to a middle class solution that can prevent the growing disparity between the rich and the poor. Robert, I agree that subsidiarity is a core principle of a happy society, in which there is the least oppression and most equal opportunity for all to become true owners. My article was related to fallacies of the ideological beliefs that underlie the rhetoric of the two main political parties. But if you want to look toward real principles to employ, subsidiarity is one of them. Ending political parties would be another principle, because political parties consolidate political influence and push for laws that serve special interests at the expense of the citizens, while masquerading as serving the interest of citizens. The two political parties in the US are each trying to turn the middle classes into serfs — just different types of serfs. Dr. Anderson, the framers of the Constitution could be loosely compared to feudal lords — governors of self-maintaining territorial states – brought together by a common adversary. Although, the American political environment has changed, our representative political system remains flawed based upon the reasoning behind the subsidiarity rule. Decisionmaking powers should be held by the smallest or lowest competent unit of an organization. Excessive self-interest is manifested among all categories of society as the centralization and consolidation of economic and decisionmaking power. To counter balance this trend, we can refer to the four position foundation thesis. Specifically, the three object purpose rule sets into place the rotation process, a deliberate round robin process that privileges all entities to take the subject position. It is the four position foundation thesis reasoning for the democratic process. The constitutional example of this three object rule is the doctrine of separation of powers into the three branches of government. Political parties are representative of segments of society. Medieval societies had segments formed along common interests — artisan tradesman, farmer laborers, builder engineers, and militarists allied with money managing administrators. Political parties formed from these categories went on to pursue their exclusive special interests to the detriment of another social segment. As you say, “… political parties consolidate political influence and push for laws that serve special interests at the expense of the citizens, while masquerading as serving the interest of citizens.” “As it seems little has changed since medieval times. “The two political parties in the US are each trying to turn the middle classes into serfs — just different types of serfs.” However, this isn’t the end. The work of the invisible hand and the reversible invisible hand is not finished. The four position foundation thesis proposes the power of heart — the intrinsic power of goodness to counterbalance the forces of excessive self-interest. Again, the framers of the Constitution were able to capture this heart in the Preamble statement of purpose, conscience and vision. In paraphrase, Unity, Justice, Tranquility…to secure the Blessings of Liberty for ourselves and Posterity. It is a statement of the invisible hand, the force of conscience and it is in agreement with the four position foundation thesis. The invisible hand only works in a free market. The percent of capitalism at work in an economy is the extent the free market is allowed to function. The reason our economy only works for the big players and largely enslaves everyone else, is because an army of corporate lobbyists are busy writing legislation to limit economic freedom to those who can afford the high costs of compliance. Bought and paid for politicians then vote these bills into law without bothering to read them. After a distinguished career of such public service, politicians and their staffs can expect very lucrative careers as lobbyists themselves. We have many more laws and regulations than could be read in ten lifetimes. We definitely do not have a free market. It would be difficult to even estimate the number of all the laws and regulations we are required to comply with to the closest million. Give it a try and see what you come up with. Include all levels of government. Father describes the ideal as one of living by conscience. We should freely live for others, serving them the best goods and services and the lowest prices. Those who do that best are the ones who capitalism rewards. Business regulations have to be repealed so all people have their right to freely love and serve others protected. Corporations are terrified of a free market. That is why most individual economic freedom has been criminalized. If families were free to use their homes to love and serve others, a lot of restaurants, hair salons, motels, car repair shops, and other businesses would have to close their doors. The quality of goods and services would go up and the prices would go down. Productivity, wealth creation, and the number of new jobs would explode on the family level. Just repealing business regulations and the income tax would create an enormous shot in the arm for the economy. To accomplish a level playing field for all, we need to separate government from the economy. Freedom cannot exist in a regulated economy because the regulations are produced by special interest groups with an agenda. It is naive to think an economy can be centrally managed or that government will altruistically exist for the public. It is as silly a superstition as the divine right of kings. John, the framers of the Constitution understood that government, economy and the public exist interdependently. The Preamble to the Constitution lays out their mutually supporting positions as security and common defense, commerce and the promotion of the public good; finally to secure the Blessings of Liberty for ourselves and Posterity. It is not naive to think that society can be managed cooperatively with divine rights, private citizen rights and civic duties. The destiny of an elder son nation is to bring this interdependent and cooperative ideal to practical fruition. The prototype of this system was the British system that incorporated the bodies of church, Parliament and mercantile economy. In hindsight, we can see that excessive self-interests took power; subsidiarity principles were not taken seriously by the church, the wealthy class or by public administrations. If there is one segment of society that can bring correction to this flawed condition then it would have to come from We the people — a conscience-driven party representative of the invisible hand. We waged a revolution against British mercantilism, but the values of consent of the governed and self-governance have long since disappeared in our culture. The tyranny we so denounced was that of British mercantilism, or the collusion of government and business to build a great empire. It is similar to corporatism or fascism. The father of American mercantilism is Alexander Hamilton. His proposal at the Constitutional Convention was dubbed the British system, featuring a president for life who appointed the state governors. The American system promoted by Henry Clay was the same as that of Hamilton, with the three main points of a national bank, high tarrifs and public works. Lincoln, longtime Whig politician and mentored by Clay, promoted the same agenda. America showed the world a glimpse of God’s kingdom through the implementation of Jeffersonian values, although these freedoms were only recognized for white men. There has always been a struggle throughout American history between liberty and nationalism, or mercantilism. Liberty is just a slogan these days. Sherman was raised by a prominent Whig family and was implementing mercantilism, in this case on behalf of politically connected railroad companies. Mercantilism is the polar opposite of individual freedom. I would contend it is incompatible with living by conscience and is not a model for God’s kingdom. The ideological left plays by a different sets of rhetorical rules. In their initial or first set of rules , expose that what has been tried and isn’t working to public expectations. Set the bar of expectations beyond what any public administration can thoughtfully achieve through incremental change . Furthermore, disparage the moral credibility of past and present leaders. As you refer to Jeffersonian values, “…these freedoms were only recognized for white men. Liberty is just a slogan.” The ideological left would argue that competitive economic practices like mercantilism or a mix of market capitalism and government regulation is “incompatible with living by conscience and is not a model for God’s kingdom.” It is an effective ideological rhetoric to conclude that “the values of consent of the governed and self-governance have long since disappeared in our culture.” This assessment is no more true than it is the tree god makes the wind blow. 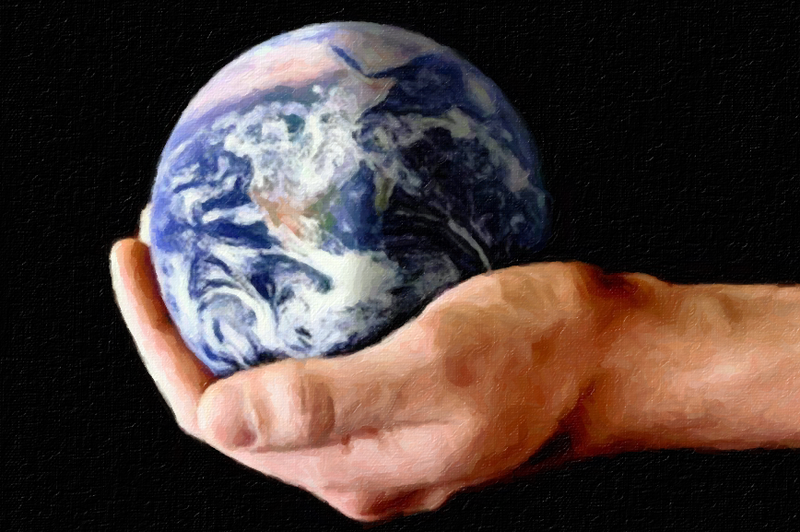 The concept of a prototype elder son nation that can lead the world began in God’s providence. It was in response to the reality of corrupt kingdoms having been established well in advance to the arrival of a chosen people with the promise of Heavenly fortune. England is a historical example of a prototype of an elder son nation. Any of the Commonwealth nations modeled after the British system of government — ecclesiology, Congress or Parliament and sustainable mixed economy could become an elder son nation. But, they would need a working example to show them the way. •	Every human being is producing and selling things that other people want, and earning enough in return to provide for his basic needs and to be a good consumer. •	There is pure competition in the market, e.g., there is a virtually unlimited number of sellers and buyers, and everyone has equal opportunity to produce, sell, and buy. •	There is no government regulation that provides an economic advantage to any player. •	There is a virtually unlimited supply of natural resources, or what resources exist are equally available at the same price to all producers or sellers. The biggest truth is that “human beings pursuing their own ends are forced to serve others or starve.” That still holds true for both big corporations and small independent startups, despite how Gordon downplayed it. Gordon stated that the conditions by which this “invisible hand” works are untenable in real life. In the end, however, some form of them are necessary for continued prosperity and they do still exist in some form. That the economy has so changed that this “invisible hand” idea “only applies to a few players, and not the majority of citizens” is false, for the “thing” being exchanged today is not just physical products but ideas, innovations, creativity, of which relate to the original value of Man. We need to view “natural resources” differently than just extractions of timber, oil, and such from the earth. Ideas and a strong will created Facebook, YouTube, Google, Amazon, eBay, Zappos, Alibaba, and hundreds, no thousands of smaller companies that are now employing millions of people, because in the end, in line with the economics of a free market, these companies are producing something of value. And the people working for these companies likewise. Also, there is an unlimited supply of this new “natural resource” called creativity, ingenuity, etc. None of these billion dollar behemoths of companies existed 20 years ago. None of them. So, how did they happen if Gordon’s thought is true, that natural resources are no longer unlimited? It is because the law of free market economics says that something of value must be created that others are willing to purchase. It is true. “Human beings pursuing their own ends are forced to serve others or starve.” That is the major point. And it is a Principled point, too. Give value first. Reap economic rewards after. That will still work 10,000 years from now. That policymakers must not be the arbiters of economic growth, for they don’t create any of it, Gordon agreed. He recognized that these past 200 years have led to incredible prosperity in the West. But he dismissed the idea that capitalism or this “invisible hand” of unselfishness will continue to work as an economic system. So, let me ask, is it cruel to force you to create value or go hungry? Gordon wants to tinker with the economic system and establish some better way of creating “economic equality,” by some means of a fantasy lawful innovation of higher order, which he doesn’t elucidate. Gordon was quite shy about proposing an answer to his critique of capitalism. He advocated for some wispy third alternative: “Understanding the necessary economic principles for growth for all in a properly regulated market, and normal economic principles at work in governments will lead to policies far different from those currently advocated by the Republican or Democratic parties.” Whatever that means. Instead, creating the environment for prosperity is what we need to do. That environment does not mean every baby born today has their baby bottles filled equally. Nor every geriatric has the same number of vacation homes. Rather, something you cannot measure, regulate, legislate, or create is in the mix of prosperity and through which only capitalism allows and engenders. And that is desire. Immigrants who came to this land with nothing in their pockets, who couldn’t speak the language, by a number of 4 to 1 are more apt to become millionaires than those born into this great land of opportunity. No “equal” playing field did that, except the one that drives dreams. Naturally, in the next discussion, I should address the concept of giving back and philanthropy, bedrock ideas spawned more in America than in any other developed country in the world by far. This unselfish giving is rooted in the same Principle of economic prosperity birthed by capitalism. And it is the more perfect safety net. I have read most of “The Tyranny of Experts” by Prof. William Easterly of NYU. He is illustrating, using many examples, that the Blank Slate developmental economic approach is having little benefit to real economic growth. The Blank Slate approach is summarized as assuming that poor people have no relevant experience or understanding of the causes of their poverty and that just taking current best Western technology and applying it regardless of the situation or understandings of such poor people is the best way to obtain economic growth. I recommend this book for the improved understanding it provides for people addressing world problems. At a conference on poverty I attended at the UN, I heard such experts advocate that they knew best how to address poverty, if only people with money would give then the money to apply their methods. The question I asked them was “Has the United Nations, through its agencies such as UNESCO and the International Telecommunications Union, considered how to apply the capabilities of electronics to address the problem of poverty?” While some speaking continued, it was apparent that it was not related to the capabilities of electronics. Yet, if there is one area of technology that is changing the world, it is electronics. Currently the number of transistors in the world exceeds the number of ants by about 100 times. Yet we are still stuck in debates about ideology that predate the collapse of the Soviet Union, and often, also the invention of the transistor. It is a device that utilizes quantum physics, which is a subject little considered in philosophy or theology, but now over 100 years old. Perhaps Prof. Easterly will write more about that in the future. Yet the Gates Foundation, which made money from increased transistor use, has less understanding of developmental economics than Prof. Easterly who mentions neither transistors, computers, TV or information technology. He does mention broadband however, though in terms of problematic expert top-down deployment. I favor empowering people to solve their own problems with technology, a bottom-up approach.